Route of the traditional two-month pada yatra from Jaffna to Kataragama. Click on map to view at full size. Among the ancient living traditions that survive in Sri Lanka, few are as well known or as poorly understood as that of the Kataragama Pada Yatra. Starting from the island's far north and ending up to two months and several hundred kilometers later at the Kataragama shrine in the remote southeastern jungle, the Kataragama Pada Yatra tradition has played a major role in propagating and perpetuating traditions of Kataragama throughout Sri Lanka and South India. Predating the arrival of all four of Sri Lanka’s major religions, it is essentially a tradition inherited from the island's indigenous forest-dwellers, the Wanniya-laeto or Veddas, as the Kataragama shrine's Sinhalese kapurala priest-custodians themselves readily concede. 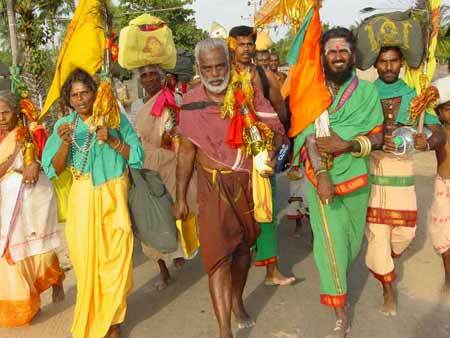 Traditional foot-pilgrimage or Pāda Yātra is not, as many people believe, a peace march, but an annual reenactment of espisodes related as legend and myth about Kataragama. Simple, ordinary people who say they have received a 'call', take part in this marathon walk. Leaving everything behind but a bundle of essentials, they experience the homeless life of a beggar or religious recluse. Deep lessons about the paradoxes of life are driven into them in a sustained act of self-denial. Sleeping and living outside, under trees and in shrines and temples; seldom knowing from where their next meal will come, braving death from animal attacks and worse in recent times; seldom knowing from where their next meal will come; braving death from animal attacks and worse in recent times; these are the factors of Pāda Yātra that make it such an intense spiritual opportunity for those who receive the 'call'. Prior to 1950 when a motorable road was extended up to Kataragama from Tissamaharama, the only way pilgrims could reach Kataragama was on foot or by bullock cart. All that has changed since then and now Kataragama is easily reachable by regular bus service from Colombo and other districts including the Eastern Province where the pada yatra tradition still flourishes. For uncounted centuries, however, pilgrims had come on foot not only from points all over the island but also from India and even occasionally from Central Asia. In 1988 the Kataragama Devotees Trust and Cultural Survival (precursors of the Living Heritage Trust) revived this ancient tradition that had gone into abeyance since 1983. That first year a mere 60 pilgrims dared to walk on this historic revival that has recently grown to over 30,000 annually. The devout respect of all for Skanda-Murukan, the wargod of Kataragama and ruler of the region, ensures the safety of the pilgrims. The traditional foot pilgrimage from Jaffna to Kataragama not only serves to raise public awareness of the traditions linking North and South, but also helps to break down barriers dividing communities long separated by decades of conflict. The very sight of traditional Pada Yatra pilgrims walking from the North once again after decades of conflict has lifted the hearts and spirits of young and old alike throughout the length of the East Coast. The multi cultural nature of the Kataragama region enables Buddhists, Hindus, Muslims, Christians and those of any other religion to practice their faith in the safety of a sacred area. Before the escalation of the war and the termination of the ferry service across the Palk Strait wise men and women representing many lineages came to Lanka as pilgrims from all over India. The tradition of visiting Adam's Peak and Kataragama (also called Dakshina or Southern Kailasa) has its origins in mythology. Hills, certain old trees, rocks and sacred groves along rivers are landmarks in a culture where everything is sacred and connected with mythical exploits. Indeed, the Kataragama region is also known as Deviyange Kaele ('the God's own Forest'). Panama is the home of a culture in transition from hunter-gatherer to cultivator. 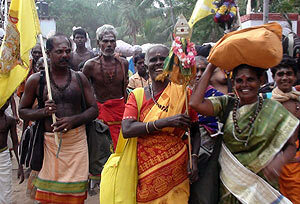 It is a forest village culture of commingled Sinhala and Tamil identity. This homogeneous culture is on the verge of disappearance in Sri Lanka due to absurd claims of ethnic purity in an island context.